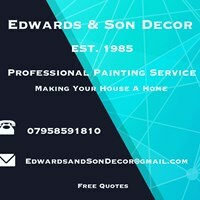 Edwards and Son Decor - Painter/Decorator based in Slough, Berkshire. Well established family run business with over 35 years of high quality experience. As a family business we take immense pride in the level of our work. NO JOB TOO BIG OR TO SMALL! Call Andrew on 07958591810 for a free quote.